Is your business prepared for the world of ANYWHERE? "Companies are beginning to conceive, design, develop, and distribute products and services in profoundly new ways...But how to exploit this new connectivity? Read on. "-From the Foreword by Don Tapscott, bestselling author of Grown Up Digital and Wikinomics "Anywhere paints a compelling pictureof what the next transformation of wireless will look like and who it will impact.Those who want to capitalize on the new wireless world should read this book. "-Dan Hesse, CEO, Sprint"Connectivity is fast creating a level playing field among developed and emergingmarkets. Those who understand how to leverage the connected world will be bestpositioned to impact it. 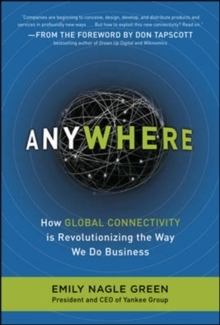 Anywhere is a must-read for anyone who wants to be arelevant leader in a global economy. "-Rajeev Suri, CEO, Nokia Siemens Networks"Emily Nagle Green takes it up a notch with a breezy style that makes the arcaneaccessible and the possible plausible. It's the kind of sensible outlook that can only comefrom deep knowledge and analytic rigor-both hallmarks of Yankee Group. "-Tom Sebok, President & CEO, Young & Rubicam North America"Required reading for anyone interested in understanding how and why communicationsadvances are fundamentally altering business. Green explains how the connectivityrevolution offers unbounded opportunity to thrive in the nascent Anywhere future. "-Reed Hundt, former chairman, U.S.
FCC"This book highlights the unstoppability of the advance of connectivity, creating theimperative for business leaders to respond. "-Ben Verwaayen, CEO, Alcatel-LucentAbout the Book:A pill bottle helps health care professionalsmonitor patients takingmedication. A vending machine reports itsown inventory over a wireless network. Atelephone speeds checkout by serving as adebit card in retail stores around the world. The future of the world-and business-is ubiquitous connectivity, the totalinterconnection of people, ideas, andproducts through a global digital network.As the network grows and the world of dataexpands, every citizen will have instantaccess to virtually anything he or she wants. Where is this network? Anywhere. And youmust learn to use it to the fullest if yourbusiness is to thrive in the coming years. In this groundbreaking book, Emily NagleGreen, president of Yankee Group, a leadingglobal connectivity research fi rm, charts acourse for the future by explaining:The components of ubiquitousconnectivity and how they willcombine to transform the natureof businessHow more than 50 of the world'sconnectivity pioneers and leadersexpect the revolution to unfoldThe richest opportunities for yourbusiness-and how to seize themHow a totally connected world willchange customers-and what they wantWays to develop a business strategythat harnesses the power of globalconnectivityThe world is charging ahead faster thanat any other time in history, and globalconnectivity will be here sooner than youmight think. Trillions of dollars of new valuewill be created on this worldwide networkfabric. Are you moving fast enough?The survival of your business depends onwhether you'll be there to meet it.Combining expert insight, tactical tools, andYankee Group's proprietary data on globalconnectivity trends, this forward-lookingbook provides what you need to reach thecustomer of the future . . . anytime andanywhere.